Your 1979 1980 1981 Trans Am or Firebird’s side marker lamps and the nose cone mounted turn signals are all available new reproduction. We offer every part needed for the turn signals and running lamps! 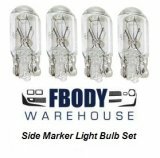 From complete new replacement kits, to simply the bulbs or spin nut retainers Fbodywarehouse has it all! Set of 4 NEW Replacement Side Marker Light Bulbs for 1970-1981 Trans Am. and Camaro models. This is a set of 2 replacement bulbs for 1970-1981 Camaro Trans Am Parking Lamps. 2 styles available. This is a complete interior and exterior light bulb kit for 1977 - 1978 - 1979 - 1980 - 1981 Trans Am. This kit will replace every bulb in your car.